Electronics World is an expert at the design and installation of outdoor home entertainment systems. Our Florida climate lends very well to extending your entertainment to the great outdoors. Whether it be music, television, movies or all three we can design a simple to use entertaining solution to satisfy your needs and budget. The design and installation of an outdoor system will begin by engineering a solution for outdoor entertaining. Other than the climate, an outdoor environment presents unique challenges for delivering an equally satisfying home entertainment experience like your indoor system. Fortunately, Electronics World has solved these engineering dilemmas and is able to provide a dependable high-quality outdoor entertainment experience for nearly every budget. Our outdoor rated TV enclosures convert your existing television into an outdoor television that is safe and reliable. Our professionally engineered outdoor TV solutions from SunBrite provide additional brightness and picture performance enhancements in order to deliver the perfect picture no matter the time of the day or night. Our video distribution products allow you to enjoy all of your home entertainment choices outside, exactly as you enjoy them in your Family Room. Our sound and audio solutions are plentiful, all designed to provide clarity and to integrate seamlessly into your decor. Our waterproof and durable outdoor remote control solutions fulfill that one button press promise to ensure simplicity of operation. 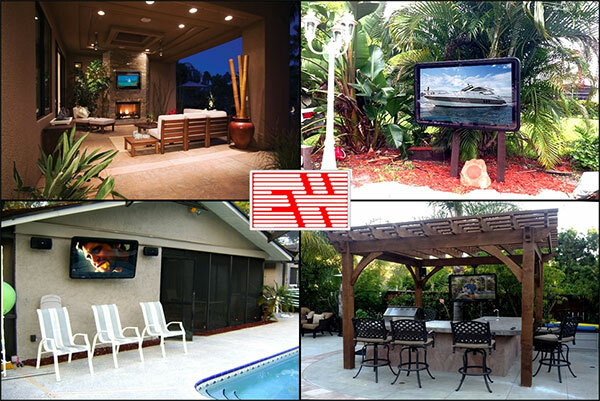 As state licensed contractors, Electronics World is your single solution to fulfill all of your outdoor entertainment system needs.